As a Hillary Clinton supporter, I ask myself not what she can do for this country, but who will join her to govern the country. Hillary alone cannot change America: it takes a team to decide and shape its norms and future values. I hope she chooses a team of powerful women who are not afraid to speak their minds and change the course of politics and socioeconomics in America. Even though she probably had a team in mind before running for president, here’s my own dream team of four women to join the Hillary’s Fierce Fab Five squad. We’re not ready to say goodbye to one of the most powerful women in America since 2008. Michelle Obama has revolutionized the definition of FLOTUS, transforming the position from “the president’s wife” to “fierce role model.” She is confident, intelligent and outspoken about her causes. Her mission throughout Barack Obama’s terms has been to seek justice in the public school system and girls’ education. She created Let’s Move!, a program to tackle childhood obesity in the United States by changing unhealthy school lunches into nutritious ones. A lawyer, activist, fashion icon, mother and wife, Michelle Obama is proof that women can do it all. The Democratic Massachusetts senator is known for striking back at Republican politicians, like Donald Trump and Ted Cruz, for their whining and false claims about her heritage. She is fierce and gives no political damns about what the public or politicians think about her. As a natural orator; her magical speech about the importance of Planned Parenthood proves that she’s a progressive feminist who will fight until she wins the battle. Last but not least, she was considered to be Hillary’s vice president, so it’s only natural she should be on Hillary’s squad. 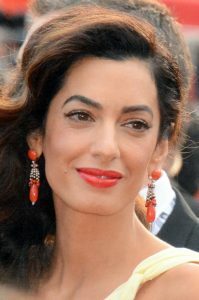 Amal Clooney’s high PHOTO VIA WIKIMEDIA COMMONS. the American women’s rights movement. During President Obama’s first term, she led the American Recovery and Reinvestment Act in early 2009 to create and save millions of American jobs, providing relief for American families and providing tax cuts for 95 percent of working Americans. She is also a LGBT activist, environmental awareness speaker and supporter of marijuana legalization. She might not be a politician or a U.S. citizen, but Clooney is a civil rights attorney who focuses on international law and human rights issues. She has contributed to the Global Summit to End Sexual Violence in Conflict initiative, which works to defend the rights of women in war zones, and in 2015 announced that she would represent Armenia in the European Court of Human Rights during its case against Turkey for the denial of the Armenian genocide. She has worked with high-profile clients, such as WikiLeaks Editor-in-Chief Julian Assange. She was so dedicated to her work that when the United Nations invited her to join the commission to fight the violations made at the Gaza Strip, she had to decline the offer. That’s how busy she was. She cares about people and uses her knowledge and status to help those who need it the most. Oh, and she’s also the wife of actor George Clooney, but with all her accomplishments, why is that of any importance?